Quick Breakdown: A side-scrolling shooter with occasional top-down segments. 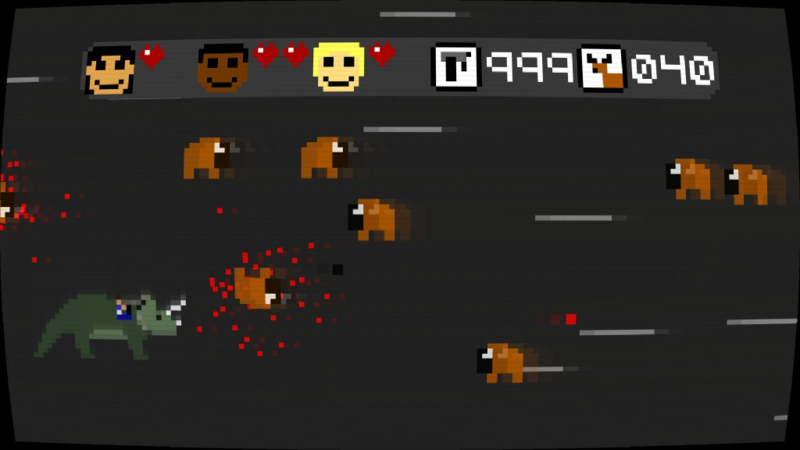 The game features buffalo, underwater buffalo, space buffalo, flying buffalo, flaming buffalo, and zombie buffalo. Also wagons. Full Review: Super Amazing Wagon Adventure (from here on SAWA) is a 2D side-scrolling shooter with pixel graphics. Occasionally throughout the gameplay, things will switch to a top-down view, allowing you to shoot in all directions. 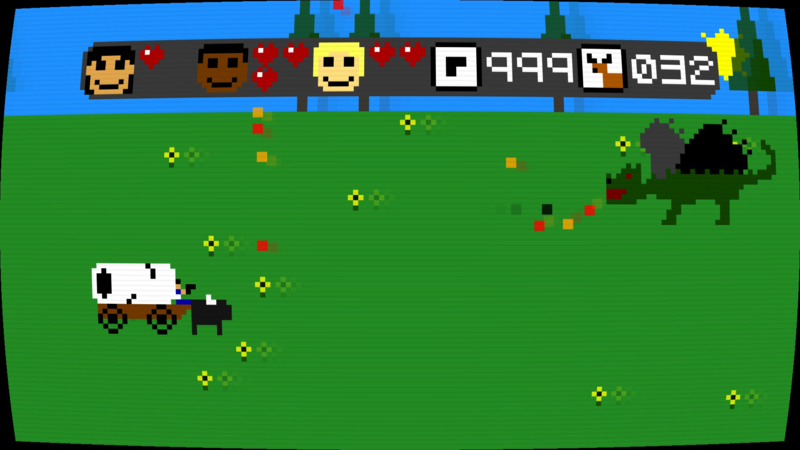 You play as a group of three travelers, all riding together in a wagon. Each one has 4 HP (never did quite figure out how the game determines whose HP to subtract from). The game features randomized scenarios, to boot. For the most part, it’s pretty simple stuff. You know, ordinary video game stuff like fighting dragons and saving the princess. But without the princess-rescuing, because I’m a feminist who believes women are strong equals who can save themselves, and those who can’t are just being picked off by natural selection. But a review isn’t complete with just the quick summary, so let’s delve into it a bit more, shall we? Let’s begin with the game mechanics first. The bulk of the gameplay is the side-scrolling shooting portion. From a gameplay perspective, it’s not anything spectacular, but it’s mildly fun. The screen scrolls automatically, and you can move up, down, back, and forth as it does, all while shooting animals that you can pick up and use as food, or fending off attacking bandits. The top-down portions let you walk about the screen and do much of the same: you fend off attacking animals and bandits. The game also features different guns for one to use, such as a flamethrower, a basic machine gun, and even the ability to summon a jet to carpet bomb the entire screen. Play-wise, it’s not the grandest thing out there, but it works alright. SAWA is designed to have randomized scenarios to mix up the game a bit. It still follows the same basic progression each time, starting out in a forest, then encountering a river, then the plains, etc. But the individual scenarios that make up each of those vary, and some scenarios are more common than others. The game will sometimes even give you occasional binary options. For example, it might allow you to use your wagon to ford a river, or alternatively you can try jumping over the river. While this doesn’t mix up the gameplay too greatly, it does help add a bit more to it, especially during the first couple times playing. All the buffalo. Just all the buffalo. Buffalo that apparently have wings to fly in a tornado. And yes, I am riding on a triceratops. As you play through the game, you’ll be able to unlock different wagons by completing certain events in-game. Follow a unicorn and defend yourself from its horde of brethren before slaying a dragon and you get a fantasy-style carriage. Discover prehistoric dinosaurs and you can ride upon a triceratops and throw dinosaur eggs that explode with baby pterodactyls that home in on enemies. The game itself isn’t very long, and a successful runthrough will only take about 10-15 minutes, but you’ll die a few times along the way. Chances are it’ll take you between 1-3 hours to finish your wagon adventure. The difficulty in SAWA is a bit wonky; while the gameplay itself isn’t too terribly difficult, it can be a bit cheap sometimes with how the RNG gods decide to treat you. You may, for instance, suddenly contract the measles, dropping your health down to 1 HP for a single character, or suddenly be blessed with an additional party member to join your wagon (effectively another set of hit points). Point being that a lot of the difficulty comes down to random events that are beyond your control, and sometimes they’re the make or break for successfully finishing the game. That’s a rather poor way to handle difficulty, and it’s a strike against the game. In addition to the main game, there are also a couple different survival modes that let you see how long you can last against different hordes of wild animals, where you of course aim for the best score possible. Completing the game will unlock a shuffle mode, which throws random scenarios at you from the game. You play until your entire party dies. Your score is the number of scenarios you can complete before something claims your life. SAWA’s graphics are done in a retro pixel art style, and really aren’t anything special. They aren’t great-looking retro-style throwback, in the vein of a game like Shovel Knight or Hotline Miami. They’re bare bones, and they’re really just there. Which I guess is okay for what the game is, but they’re nothing to get excited about. Likewise, the music for the game isn’t very notable either. In the end, it’s by no means a must-have game, but it’s only $3 on Steam, and it sometimes goes on sale for even less than that. So while even at that price point it’s not a must-have, SAWA can be a fun way to kill some time if you’re in the mood for this sort of thing. Tune in tomorrow for a wagon adventure!